Anyone planning to start a business via the world wide web soon finds him or herself presented with a vast array of software choices to serve as a foundation for an online store and its storefront. Whether via personal research, peer recommendation, or advertising, one will have numerous options which are helpful, but can also cause a bit of complication. Which one will be the best to use? A number of these options can appear as bargains, but choosing one can turn out to be quite the task. There are a lot to choose from. Popularity and functionality are two traits that need to be top considerations. 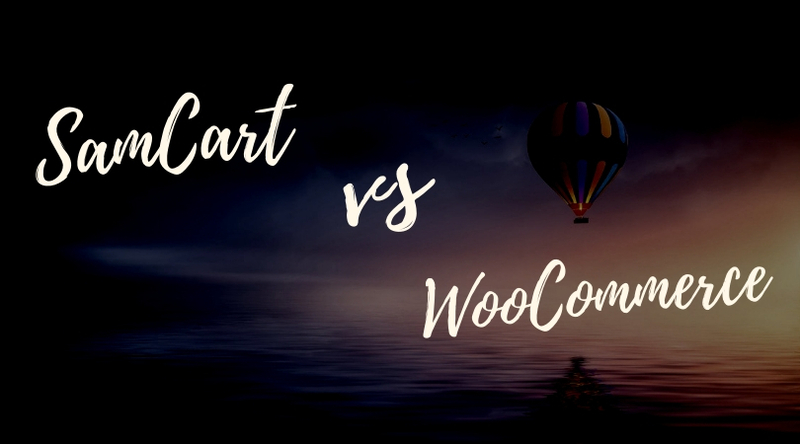 Two e-commerce solutions have been floating around blogs with those exact traits – SamCart and Woocommerce. Both of these services will allow a business to maximize sales with ease and provide multiple degrees of assistance to both seller and buyer. Let’s take a deep dive into both web-based software packages and compare advantages and disadvantages to see which will ultimately help an online entrepreneur more. SamCart is an internet-based software that serves as a platform for product or service check out. It gives you templates with improved conversion together with features such as one-click upsell, subscription, order plans, and payment plans, to name just a few. All SamCart software features are geared to boost revenue for sales. Each feature tries to direct the prospect to the conversion, a big reason why SamCart’s popularity has been increasing with online businesses and merchants for the past couple of years. SamCart’s checkout templates have been proven and tested intensively for better conversion rates when compared to its competitors. The upsell feature of the software almost guarantees a one-third increase in sales, according to a study. Maximizing conversion means more sales, more profit, and ultimately business growth. An upsell, by definition, is a method to improve the value of the average consumer purchase by adding a partnered service or product to the original sale item. Current SamCart users stress the impressive efficiency of its One Click Upsell feature. By making the upsell relatively easy, store owners get more customer lifetime value. This unique feature provides various payment method options to customers while on the same single checkout page. There is no need for separate pages for different payment plans. It has been shown that if a customer stays on a checkout page longer, interest and conversion rates go up. Eighteen customizable templates, that are professionally designed and tested by seasoned marketers for improved conversion, are available for use. This saves valuable time and effort on the user side, as it eliminates the need for further testing and designing that will take hours. Each template has guarantees, testimonials, and security assurance. The user can customize a chosen template from header color, button options, personalized footers, and so forth. Fields describing product specifications can also be added, so customers have that information readily available. Templates are also responsive. The software gives suggestions on related products based on purchases and previous buyers with similar transactions. Bundling an auxiliary product to a main one highly increases the profitability of each sale. Cross-selling is a very common practice not only in e-commerce, but also in more traditional businesses, such as automobiles and fast food. SamCart enables live Split Testing capability, which means product comparisons can be done faster. Users can also customize variations and specifications when necessary. This is crucial for a web shopping cart business, considering most items added to a cart are abandoned at a high rate. Woocommerce is an open-source e-commerce plugin designed for use with different online merchants. It functions with ease on WordPress, allowing developers and online entrepreneurs full control. It also provides access to free and premium WordPress extensions. Woocommerce boasts a 30% install and usage rate on active e-commerce sites. This percentage is relatively high, considering e-commerce has been on a very steady upward trajectory, gaining popularity over millions of users worldwide. Adding to its open-source functionality, the framework of Woocommerce boasts strength and flexibility, making it extremely versatile and extendable. It can accommodate most services made for integration with Representational State Transfer API. Developers also get robust analytics. From the most basic to the high-end type of online business, this software can be customized. With a growing collection of more than 300 available extensions, you can improve, upgrade, and augment store features to match specific client needs. Storefront allows users to create and choose themes, automatically removing conflicts with plugins in the event of major updates along with extensive Woocommerce integration. Storefront can be customized to give it a more personalized style without abandoning its primary functions. Variations, configurations, consumer downloads and even selling affiliate products from other online marketplaces are possible and encouraged. Moreover, with premium extensions, a seller can provide his or her target market with recurring subscriptions, memberships, and bookings. SamCart and Woocommerce don’t exactly integrate with each other. Some sites will say otherwise, but even experts have trouble at times. SamCart supposedly allows integration by making check out links editable, but no button, tab, or link can be found to do so. Woocommerce, being an auxiliary plugin, has its checkout link dynamically created. Calculation for all of the products in the cart can be done and sent with the click of a button, sending information straight to the check out process. SamCart apparently does not provide the Add To Cart feature with some online shops. In these shops, a customer can only purchase one item at a time. Yes, you can use “add upsell,” but the cart only supports one upsell before checkout. It does make the check out process optimal, however. Some users say SamCart templates are too generic as well. In short, it is only logical to pay for SamCart if your business does not have many upsells. In the event that you look at multiple product marketing, and you already have an online shop, you may want to consider looking at Woocommerce.